Madingley Parish Church was filled to capacity at the funeral service for the Rev’d John Mullett on 22nd August 2017. Members of his family, his past parishes, his College, his friends and neighbours came to give thanks for a life well-lived, for his ministry, his example and kindness. Madingley residents will remember John as ‘our Vicar’ for 17 years. He arrived in 1990, with his wife Joyce, to retire in Church Lane but it wasn’t long before he accepted the invitation to become our ‘officiating priest’ – faithfully leading services, spearheading restoration projects, visiting the sick in hospital, the frail in care homes and operating an ‘open door’ policy to everyone in the village. John was born in Sheffield in 1925 but the family soon moved to Ponders End in London. Aged only six, he was admitted as a choirboy at St Matthew’s Church where his father was vicar. Subsequently he became a chorister at Westminster Abbey where he sang at the coronation of King George VI. He won a place at St Catharine’s College, Cambridge completing one year of his course before he joined the Royal Navy in 1943 as a sub-lieutenant (a writer more commonly known as a ‘scratch’). When war ended he returned to Cambridge to read Theology and continued his ministerial training at Lincoln Theological College, where he met Joyce. Following their marriage in 1952 John and Joyce moved to Southern Rhodesia via Turkey where he became Rector of St Luke’s, Que Que. His parish was approximately the size of Wales! One of the main passions of his ministry has been education and he was responsible for 15 mission schools in his parish. Whilst in Rhodesia his son John and daughter Anne were born. After eight years in Africa the family returned to the UK where John became vicar of St John’s Bollington. This was followed in 1969 by an appointment as Vicar of St Saviour’s Oxton, Birkenhead. He was also appointed to the Church of England’s General Synod and was a member of the working party for the Alternative Service book. 1977 saw the Mullett family move south to Ashwell, where John was appointed Rector and, in 1982, Rural Dean of Buntingford. This brought him closer to his beloved College of St Catharine’s (and the University library). He was elected Fellow Commoner and editor of the College magazine. John was an accomplished musician; indeed, his first relationship with Madingley Church was playing the organ during our 900th anniversary celebrations. Every February, we were treated to a wonderful concert given by the choir and musicians of St Catharine’s College at Madingley Hall. His long period of service to the parish as ‘officiating minister’ provided continuity and leadership to the church congregation and enabled many phases of restoration work and improvements to be carried out to the church. The larger congregation and strengthening of the church ‘family’ was exemplified by the two Confirmations and other special services held here during this time. John joined in with all village activities, he walked the ‘Bounds’ of the Parish, was master of ‘working a room’ at social events and is remembered for his terrific sense of fun and for countless private acts of kindness. Of course, none of this would have been possible without the support of Joyce. They truly valued the intrinsic peace, beauty and love that surrounded them during these precious years in Madingley. 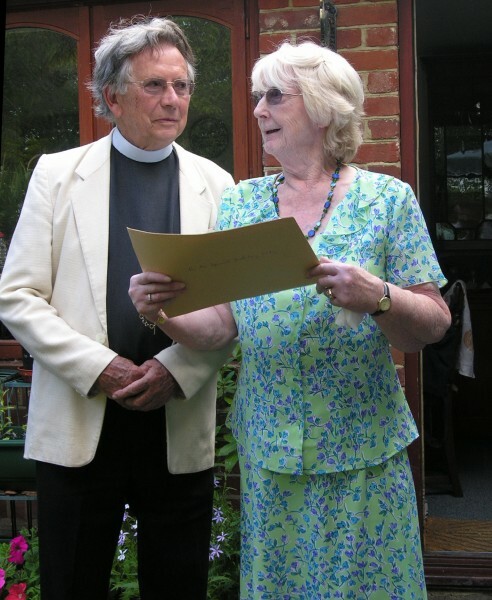 They made the congregation part of their family, involved in every significant family event including wonderful parties for their Golden and Diamond Wedding Anniversaries and a celebration of John’s 50 years of ministry in 2001. The family are now so grateful that they have found their final resting place amongst the people and surroundings they loved so well. THANK YOU JOHN! Madingley will always be indebted to you and you will always be remembered with love and appreciation.